to documentation, data availability and a worldwide customer support network across different regulatory systems with various national authorities. The Lufthansa Innovation Hub (LIH) opened its first foreign office in Singapore on Monday, 28thof January. Singapore and Berlin. 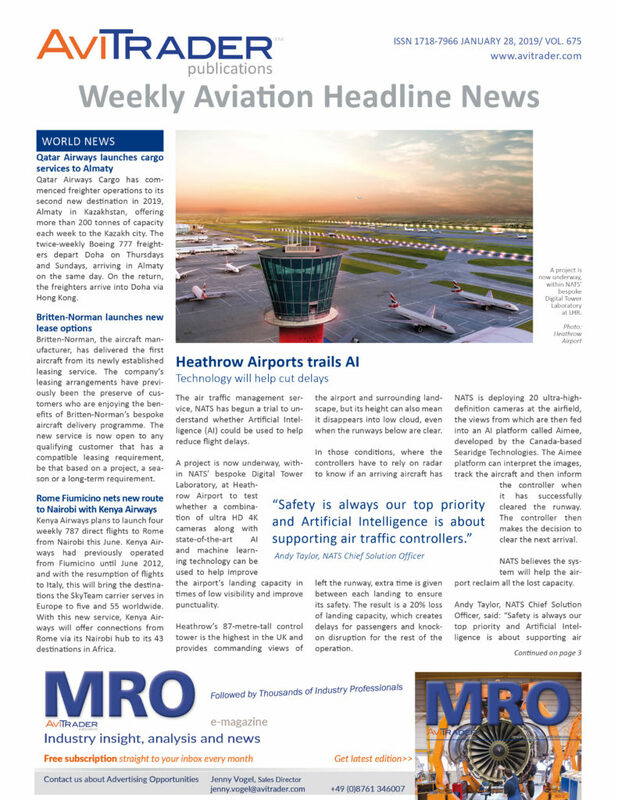 The aim is to publish key findings in a whitepaper and to implement them a test project, which will be validated in conjunction with the Lufthansa Group. Marion Siuta will join TrueAero's leadership team as Senior Vice President of Acquisitions. 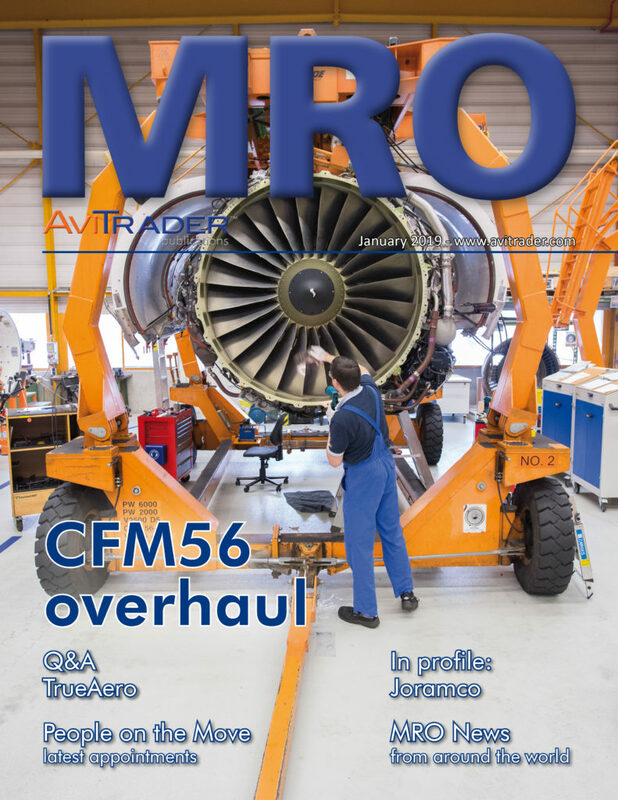 Siuta's purview includes sourcing mid- to end of life aircraft and engines for part out and lease, while helping to grow TrueAero's line of technical service offerings. In addition to working on the Trent 1000, the 127,000 ft² facility will also carry out services on the latest generation Trent 7000 and Trent XWB engines. There is now increased capacity for maintenance of Rolls-Royce engines, supporting a wider services strategy of an increasingly capable, competitive and flexible CareNetwork. The improved network will minimise time engines spend being maintained, and maximise flying time. MAC Aero Interiors enters the Chinese aircraft cabin interiors market by establishing a Joint Venture with Benniao Aviation. The newly launched MAC Sichuan will be providing cabin total technical care support to Chinese aircraft owners and operators. Boeing has reported fourth-quarter revenue of US$28.3 billion, GAAP earnings per share of US$5.93 and core earnings per share (non-GAAP) of US$5.48. These results reflect record commercial deliveries, higher defense and services volume and strong performance which outweighed favorable tax impacts recorded in the fourth quarter of 2017. Boeing generated operating cash flow of US$2.9 billion, repurchased 1.6 million shares for US$0.6 billion, paid US$1.0 billion of dividends and completed the acquisition of KLX. Revenue was US$101.1 billion for the full year reflecting higher commercial deliveries and increased volume across the company. Records for GAAP earnings per share of US$17.85 and core earnings per share (non-GAAP) of $16.01 were driven by higher volume, improved mix and solid execution. Commercial Airplanes fourth-quarter revenue increased to US$17.3 billion reflecting higher deliveries and favorable mix (Table 4). Fourth-quarter operating margin increased to 15.6%, driven by higher 737 volume and strong operating performance on production programs, including higher 787 margins. Commercial Airplanes booked 262 net orders during the quarter, valued at US$16 billion. Backlog remains robust with nearly 5,900 airplanes valued at US$412 billion. TrueNoord, the specialist regional aircraft lessor, has leased five new ATR 72-600s to InterGlobe Aviation (IndiGo). The first two aircraft were delivered at the end of December with the remaining three integrating with the fleet in the coming months. The Chicago-based parts trading company Aero Trade is going through a rebranding and warehouse relocation. The extensive stock of Airbus and Boeing Rotables, as well as the multiple APUs for their lease and teardown programs needed more space. The success of the last two years made a purchase and move to a state of the art new warehouse mandatory. By renaming the company to Setna iO, the goal is to differentiate from other trading companies as much on the service as in the name. The global team members in Chicago, Arizona, California, London, and France look forward to continuing to serve their customers and vendors.